Penguins! Endearing creatures that seldom get eaten by polar bears, of geographical reasons. I've come across them in a few different contexts lately. One example is the story of the two male Humboldt penguins, Z and Vielpunkt (picture) , who are raising a chick together in the "Zoo am Meer" zoological park in Bremerhaven, northern Germany. 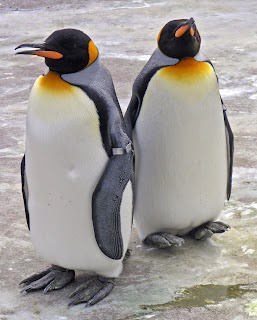 The proud fathers are one of three homosexual penguin pairs at the zoo. They assumed the role of surrogate parents when an egg was cast aside by a heterosexual pair. The zoo has tried to have gay birds incubate an egg before, but this is the only occasion it has worked. The story has appeared at least in the Huffington Post and the Local (Germany), and on Of course, I could be wrong... and the Pet Blog during the first days of this month of June, 2009. Did you ever wonder why there are no dead penguins on the ice in Antarctica - where do they go? Wonder no more!!! It is a known fact that the penguin is a very ritualistic bird which lives an extremely ordered and complex life. The penguin is very committed to its family and will mate for life, as well as maintaining a form of compassionate contact with its offspring throughout its life. The male penguins then gather in a circle around the fresh grave and sing: "freeze a jolly good fellow."